«By announcing new blocks in the Norwegian Sea and the Barents Sea, the government facilitates an increased activity level in the area», Minister of Petroleum and Energy Tord Lien says in a press release. According to Lien, the round of so-called Awards in Predefined Areas (APA) includes blocks located in the vicinity of existing discoveries, among them the Hansteen field in the Norwegian Sea and the Castberg, Alta and Gotha fields in the Barents Sea. The round includes the geologically most mature parts of the Norwegian continental shelf, where the expected size of discoveries is smaller than other licensing rounds. Exploration largely focuses on smaller discoveries that would not justify independent development but may be profitable if developed in conjunction with other discoveries and/or utilising existing or planned infrastructure, the ministry informs. The application deadline for companies is 6th of September 2016. The ministry aims at awarding the new production licences at the beginning of 2017. 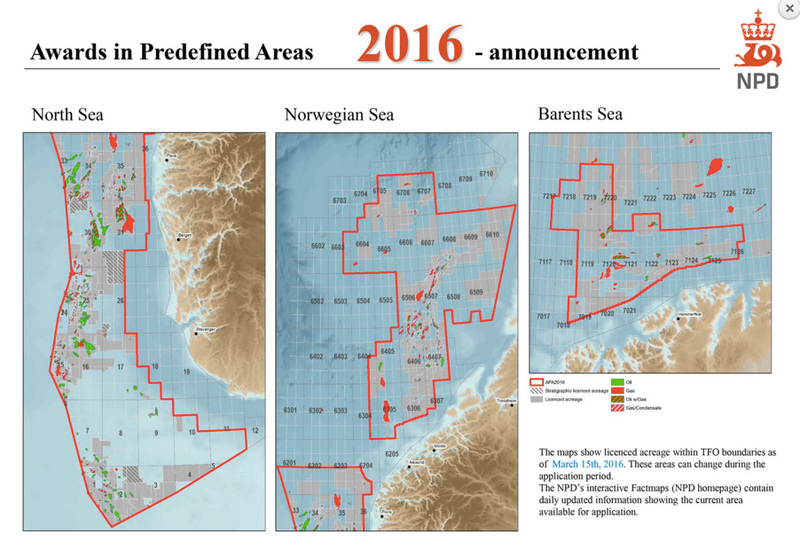 Awards in Predefined Areas (APA), is one of two equal licensing rounds on the Norwegian continental shelf. In addition to the APA, the Norwegian government is in the process of preparing the 23rd Licensing Round, which will include blocks located further east and further north than ever before on the Norwegian shelf. A total of 54 new blocks in the Barents will be on offer, eight of them located immediately along the borderline with Russia and another eight north of the 74th parallel.